Give board meetings a whole new meaning by bringing your team together for some blue sky thinking on our kayaking safaris for corporate groups. Perfect for all ages and abilities, this is an activity that the entire company will enjoy. Everyone will want to be part of the agenda on our kayaking tours for corporate groups. Invigorating and action-packed or chilled and refreshing, they can be switched up or tempered down depending on your team dynamics and will bring a whole meaning to team meetings. With everyone kitted out in a wetsuit and paired up with a kayak and paddle, we’ll run through the vital safety info before getting to grips with basic strokes and key manoeuvres. Then it’s time to hit the water. From the shallows of Towan Beach and with the big, open waters beckoning, we’ll paddle out of the bay to the Gazzle, a stunning stretch of coastline teaming with marine wildlife and unique features. Here the kayak becomes a unique viewing platform into the underwater world below and as we glide along the coast keep your eyes peeled because you’re guaranteed to encounter an array of marine wildlife – it loves Newquay as much as we do. Seals, otters, Kingfishers…it’s all up for grabs and we’ll help you to identify it. 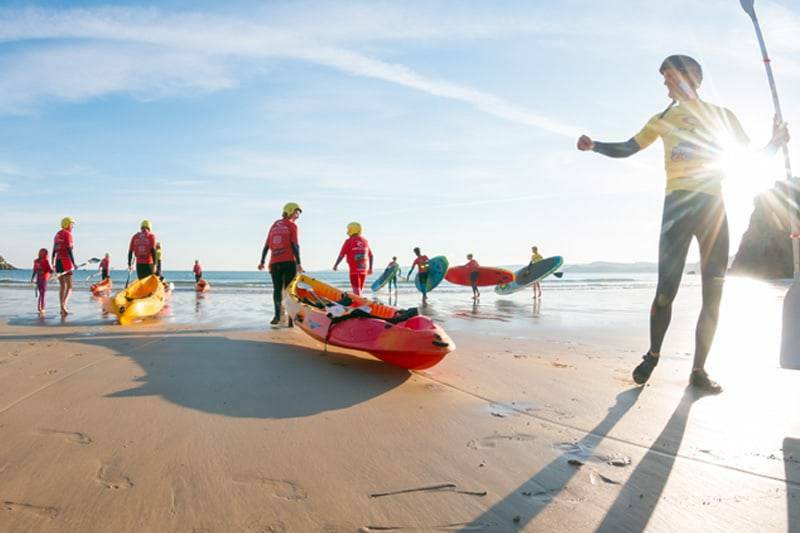 Combining the contemporary, action-packed side of Newquay with its fishing and traditional past, our sea kayaking adventures fuse Newquay’s two alter egos. Delve into hidden coves once favoured by smugglers, paddle through waters where ships have met their fate and hear tales from days gone by. Our instructors are as clued up and as passionate about Newquay’s history as they are about getting active. As well as the Gazzle, other route options include the serene and sheltered Gannel estuary, Towan Head and the wide expanse of the bay. Whichever path you take the ride will be gloriously scenic and ridiculously buzz inducing. We work hard and play hard. We’re TripAdvisor’s number one outdoor activity provider, two-time gold winners of the Cornish Tourism awards and two-time silver winners of the South West Tourism Awards. We’ve also got almost every watersport based qualification going and can regularly be found topping up our training plan. We’re mighty proud of our credentials but what sets us apart is our love for Newquay and the ocean. We’re fuelled by a passion that never waivers and get the ultimate buzz from sharing it with others. Our official partnership with the Armed Forces speaks volumes as does our status as a recognised provider for Outdoor Learning Programs for schools in Newquay. You’re in good hands with us!